The great British Airways Champagne crisis. I’m writing this blog post a little tongue in cheek, but I think there’s a valid point to be made. 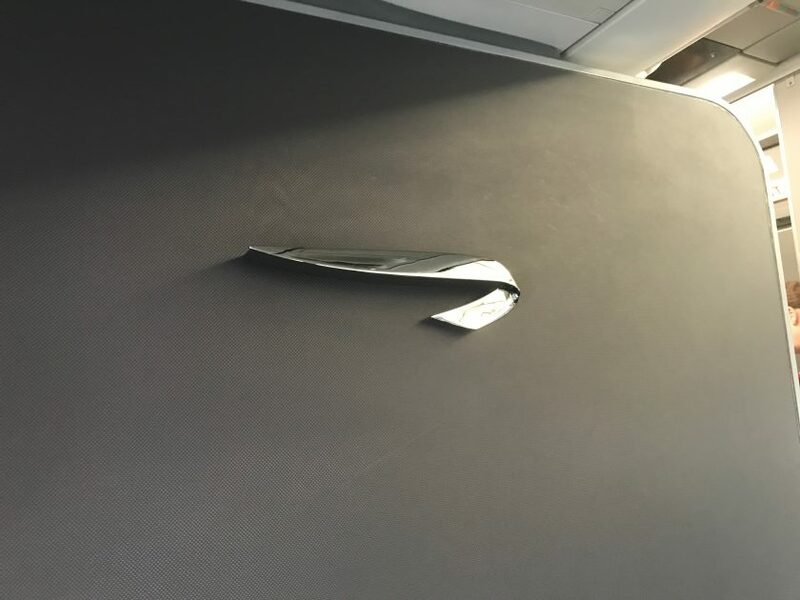 It’s very much a #firstworldproblems kind of article, but I think illustrates how far British Airways has cut costs and diminished the overall customer experience. To start off with, the good stuff. 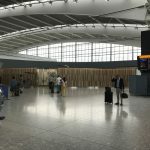 The First Wing at terminal five is the biggest single improvement to the overall customer experience that British Airways has made in ten years. For those that aren’t aware, it’s the new premium check-in area at the southern end of terminal five. 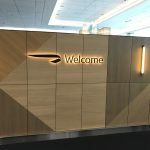 It leads directly into the Galleries First lounge, and thus is only accessible to BA Gold card holders, oneworld emerald card holders and their eligible guests. 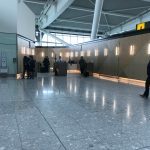 For those that are familiar with terminal five at Heathrow, it’s where first check-in was, however is now a walled off area. To the left you have the bank of check-in desks and to the right you have the boarding pass check which leads through to security. I’ve been through a few times and security has always been empty, but more importantly friendly. The staff are far less hectoring and much more pleasant compared to the main security area. 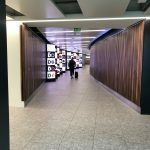 After security, which seems very well thought out, you turn left and walk through a small tunnel with video hoardings and are deposited straight into the lounge. Which is where the great Champagne Crisis occurred. So some history, British Airways traditionally has had some reasonably good champagnes in the Galleries First at Heathrow. For a few years there was Taittinger Millésimé along with a Rosé, then they switched to Henriot Millésimé, also with a Rosé available. They’re not bad drops and retail for £35 to £40 a bottle. However on Thursday, they were serving this. 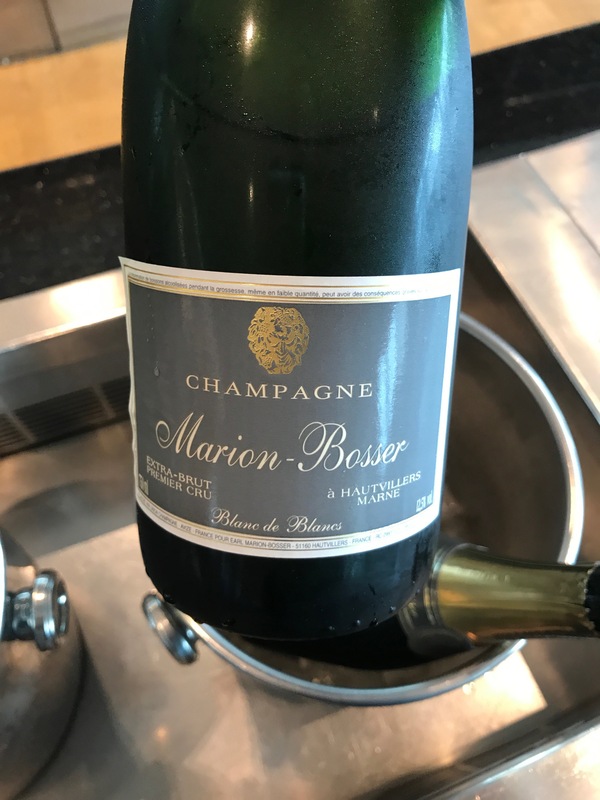 Some quick research shows it somewhere between £15 and £20 per bottle – essentially the cheapest Champagne that’s still a Champagne, as opposed to French sparkling wine, Prosecco or Cava. It tasted cheap too. 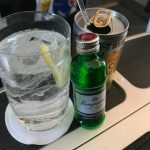 I enquired with the food manager from Baxter Storey, the company that does all of the lounge catering, and he explained that British Airways supply them with all of the alcohol. The Henriot ran out a few days ago and they were given this, and no rosé for the next few weeks to serve. He had no idea how long it would be around for. After that disappointment, it was almost time to board so I wandered down to gate A11 for boarding. 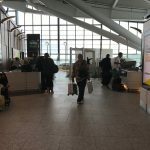 There was an announcement for Club Europe and Gold card passengers to board first, which was really good to hear. A usual, there was the standard Heathrow faff of a 40 minute taxi to takeoff. 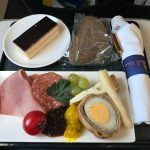 Once in the air, the new Club Europe meal service was served. I picked the ploughman’s lunch with a G&T. It was adequate. The staff were fine – again nothing special. Had to ask for top-ups of water so there wasn’t anything terribly proactive about the service. Very much a cursory A to B type of journey. Finally we approached Zurich and the weather closed in somewhat; on final approach the Captain decided to go around after there was a rain cloud over the threshold. After a few moments he came on the tannoy and said “we had a warning about the wind”. He was excellent about communicating what happened and giving us updates. After around twenty minutes of circling, he deemed it was safe to approach again and we landed entirely uneventfully. It was very much a reminder that aviation can be complicated, and that safety is always paramount. Whilst nice service, food and beverages are always welcome, the professionalism of the crew is paramount. At least that hasn’t been cut by Alex Cruz. Yet. 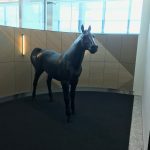 Previous Post: Qantas First Lounge. Sydney. There’s nothing more classy than Googling the cost of the Champagne your drinking in order to gauge how premium an experience you are having. I’ll take the feedback! However if you’re going to serve some champagne that firstly doesn’t taste very good, is it unreasonable to do some research into it? BA have had good champers from second growths in the past. For a while the Club World champers was Ayala, the second growth of Bollinger, which is a lovely drop. So nothing against the secondary suppliers, just don’t like stuff that’s rubbish *and* cheap.